Prepositions Rules are provided here. 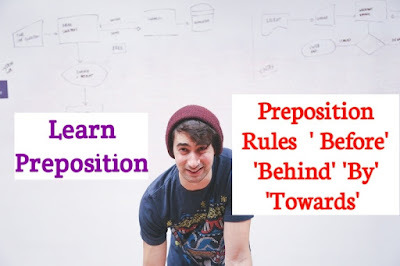 If you learn prepositions, you daily read our blog. Here we discuss every preposition rules with preposition examples. You know, Prepositions are very important for English Grammar. Every student should know preposition rules, definition, kinds and use with Preposition Examples. Preposition Rules ' Before', 'Behind', 'By', 'towards' are below here. You should carefully read this articles. If you are a student, then all these posts are very useful to you. In an earlier post we discuss more prepositions rules, use with preposition examples. So you must read all blog this post. My aunt came here the day before yesterday. There's tree before my house. Her names come before Jhon's on the list. The criminal was brought before the judge. He wishes for death before dishonor. There is a garden behind our house. He is behind other boys in swimming. There was a smile behind his frown. The train is behind its time. The storm left a trail of destruction behind it. Our school is by the river. She sat by me/by my side. We came by the roads. He goes by the college hostel every day on his way to school. I will finish the work by tomorrow. He makes a living by teaching. He was killed by a tiger. Seize him by the neck. It's 6 O'clock by my watch. He is senior to me by five years. He sent later by post. I met Ammy by Chance. One can achieve what one wants by determination. He is American by birth. You walked towards the bridge. He feelings towards us are not friendly. I don't know what is the attitude towards the proposal is. You must be saved money towards your daughter's marriage. I shall come towards the evening. Next day we discuss the rules of others Preopostion. So please continue reading this blog every day.